Buchaechum is a traditional Korean fan dance in which dancers use colorful fans. 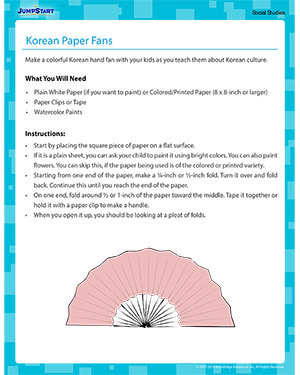 Kids can learn about this dance and more about Korean culture with this crafts activity that shows them how to make a colorful fan. You can also show them a video of the dance. Kids will enjoy learning about the world with these fun activities.